I always like to try to get my students excited about Art History with new projects. Ordering supplies has been a longer process than I expected so I decided to make use of the construction paper scraps the previous art teacher had wisely saved by designing a Matisse project. My goal was for the students to learn about organic and geometric shapes, color, composition, and Art History. The title slide of my PowerPoint showed Matisse working in his studio. Next, I showed an image of Woman Reading from 1894 followed by the Woman with a Hat (Madame Matisse) from 1905 followed by the Red Room (Harmony in Red) from 1908 to show how he progressed from a pretty realistic representation to more abstract paintings which showed his increasing interest in color and shape. All of the students agreed that Woman Reading looked real and at first seemed a bit confused by making things look progressively less-real. I remembered everything I could about Harmony in Red from my Art History II class (thank you, Monica!) and talked my student through the elements and principles of the painting. 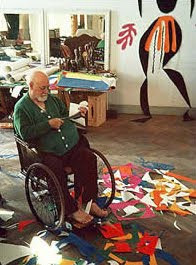 After the paintings, I showed the students about a dozen of Matisse's paper cutouts. We spent time critiquing a couple of the cut outs in each class with Describe, Analyze, Interpret, and Judge. I pointed out how Matisse made his compositions more interesting by overlapping shapes and by using both organic and geometric shapes. When talking to students about shapes, I try to keep it pretty simple by explaining that organic shapes are shapes inspired by nature and geometric shapes have regular edges like the shapes they learn about in Math class. I told the students what their project requirements were and modeled the process with my example below. The students were supposed to use many colors, have overlapping, and use both organic and geometric shapes. I added to my example with each class. I told the students not to draw the shapes with pencil before cutting, just to draw with the scissors. I only had bottle glue available so I showed the students MANY times how little glue it takes to hold the cutouts in place. One of the students chanted "just a dot, not a lot" and I really liked the ring of it! I showed them how you hardly have to squeeze the bottle just to do tiny dots. I turned my paper upside down and said if the glue drips, you used too much. The students finished their projects in one class period. Some students just made abstract compositions while others created illustrations. I did not tell them which to do. This student is so fun, she ALWAYS tells a story with her artwork, regardless of the assignment. There's a cool mask going on in this picture. I love the green rectangles in this one. This was a fun landscape. Very symmetrical. View the entire Artsonia exhibit HERE!